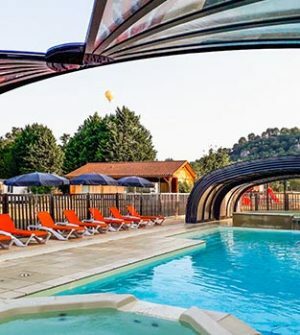 Intro by Campsite... 'Small, quiet, family size campsite in the Périgord Noir, campsite 'La Sagne' welcomes you to the town of Vitrac, close to Sarlat on the border of the River Dordogne. Ideally located for visiting the surrounding area, we have several types of accommodation for your holiday, shaded or sunny pitches, mobile homes with 1/3 rooms or fitted out tents. The campsite has direct access to the river and a covered and heated swimming pool, paddling pool and Jacuzzi. In July and August, we have family entertainment several evenings of the week.